Tubbygaijin.com » Ooo, Shiny Meters! 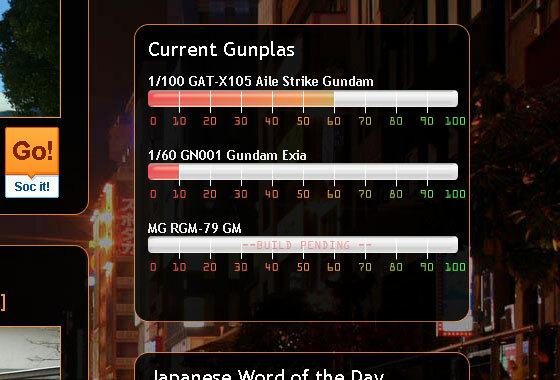 In preparation of lots of Gundam building over the coming year, i’ve spruced up the ‘Current Gunplas’ widget on the sidebar to something alot more visual at a glance, comments welcome! Will be writing a 2009 stash post later today. 2 Responses to Ooo, Shiny Meters! looking good I like ’em and looking forward to the building updates. What plugin or resource are you using for the meters? Cheers! I actually self made them in flash, controlling them manually at the moment by embedding different swfs in until I can write a system to swap them out using radio buttons or something!